PAW Healthcare – Apply to speak! The Call for Speakers closes on April 4th for speaking at Predictive Analytics World for Healthcare (October 29 - November 2). Want to inspire healthcare professionals who are focused on data analytics? Beat the deadline and apply to speak now. 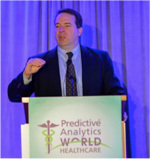 Predictive Analytics World for Healthcare focuses on real-world examples of deployed predictive analytics among healthcare related organizations. The conference assembles the industry's leaders to deliver case studies and expertise, revealing how predictive analytics improves patient care, reduces costs and brings greater efficiencies to the healthcare industry. Speakers enjoy strengthening their reputations as experts in predictive analytics while boosting their company’s reputation as a leader in predictive analytics. This is the final reminder – Submit your proposal now or by April 4th to speak at the fourth annual PAW Healthcare conference.